LONDON (AP) — Retiree Richard Moore arrived at Heathrow with a suitcase of summer clothes for a Miami cruise only to be sent to Denver. Susan Danby wondered if plans for a joint 50th birthday celebration in Las Vegas would be a losing bet. The start of a three-day strike by cabin crew at British Airways spurred chaos and passenger angst on Saturday as union members promised more airline and rail walkouts in the coming weeks as Britain prepares for a hotly contested general election. "This is our dream trip, we booked it last August and we've been planning it for years," said Danby, who was still hoping to get to Las Vegas with her friends. "We all want more money and better conditions, but people shouldn't ruin other people's holidays." BA's cabin crew are disputing a pay freeze and changes to working conditions. Their Unite union also says BA didn't inform it of cost-cutting plans. 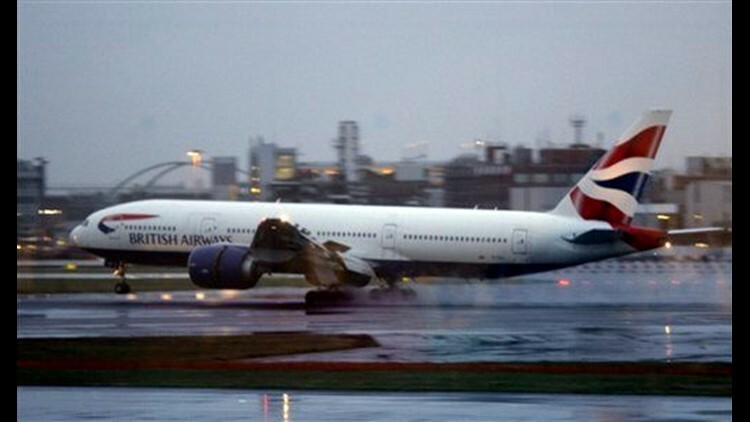 BA said it would handle as many as 49,000 passengers on both Saturday and Sunday. That compares with the average 75,000 for a normal weekend day in March. At its Heathrow base, more than 60 percent of long-haul flights were operating, but only 30 percent of short-haul. At Gatwick, all long-haul flights and more than half short-haul flights were running as normal, as were flights from London City airport, including flights to New York. The public backlash is bad news for Prime Minister Gordon Brown's Labour Party, which relies heavily on funding from the country's labor unions, and a gift for the main opposition Conservative Party, which is leading opinion polls ahead of a general election due within weeks. Brown has been stuck between a rock and a hard place, angering Unite — which has contributed some 11 million pounds ($16.5 million) to Labour in recent years — for criticizing the strike action, while at the same time facing criticism from the Conservatives for allegedly bowing to the union. "This threatens the future of one of Britain's greatest companies along with thousands of jobs," Conservative leader David Cameron said on Saturday. "Will the prime minister come out in support of those people who would cross the picket line? No — because the Unite union is bankrolling the Labour Party." Cameron is seeking to evoke memories of the difficulties the Labour government had in the 1970s, culminating in the mass strikes that became known as Britain's "winter of discontent" and led to the election of Conservative leader Margaret Thatcher in 1979. The Conservatives' campaign is being aided by the increasing likelihood of further strikes in the run-up to the April 2-5 Easter break and a national election that must be held by June 3, though a May 6 date is more likely since local elections are already scheduled for that day. The Rail Maritime and Transport union is expected to announce walkout dates next week after railway signal workers and maintenance staff voted in favor of a strike, while the BA workers are due to go out again March 27-30. At BA's London Heathrow hub on Saturday, the cavernous Terminal 5 was nearly deserted after some passengers had flown out early to avoid the strike or simply stayed away altogether. The airline's chief executive Willie Walsh assured customers in a Youtube video that many cabin crew staff had turned up for work and that the airline managed to reinstate some canceled flights. But fears of longer term damage to the reputation of Britain's flagship carrier appeared founded. Moore, the retiree trying to get to Miami, said he was "one ticked-off customer." Charity worker Elizabeth Robb, waiting for a delayed flight to Dubai, said she was unsure she would book with the airline again. "It makes me sad because BA is such an iconic marque (brand), a part of British culture," she said. The acrimonious dispute with its workers will be financially crippling for BA — analysts forecasting it could cost the airline more than the 63 million pounds ($95 million) that Walsh is trying to save through the changes to workers' pay and conditions. Walsh has warned that the airline, which has been particularly hard hit by the global economic downturn because of its heavy running costs and reliance on increasingly unpopular premium fares, risks bankruptcy. But at a rally of hundreds of striking workers in Bedfont, north of London, Unite spokesman Steve Turner said BA "is effectively at war with very proud, very dedicated employees." The airline on Friday offered a compromise on a proposed pay freeze this year, offering a 3 percent rise next year and the year after and then an inflation-linked increase in 2013/14 capped at 4 percent. The other changes include a switch to part-time work for 3,000 staff and a reduction in cabin crew sizes from 15 to 14 on long-haul flights from Heathrow. U.S., German and Spanish unions have given some support for Unite's action, but stopped short of pledges for coordinated activity that would disrupt BA's ability to refuel and service the planes it is operating during the walkout. "Many of us have taken decisions not to pull extra flights or routes to help BA pick up the slack," said a pilot for a Chicago-based airline, who spoke on condition of anonymity for fear it could cause him repercussions with his job. The U.S. is also facing its potential largest airline strike since the Northwest Airlines walkout in 2005, with American Airlines workers considering action in a dispute over pay. Associated Press Writer Gregory Katz contributed to this story.